On Sunday, March 9, the University of West Georgia’s Ingram Library hosted a program commemorating former Georgia House Speaker Thomas B. Murphy’s 90th Birthday. Born in 1924, Speaker Murphy would have turned 90 on March 10. Approximately 130 people attended the Sunday afternoon event which included a reception, a showcase of selected items from the Library’s Special Collections, and a program in which remarks were made by Steve Anthony, Chief Aide to Speaker Murphy from 1981 to 1995; Rep. Calvin Smyre, current Georgia House of Representatives member and Speaker Murphy’s colleague from 1974 to 2002; and the Honorable Michael Murphy, Chief Judge of the Tallapoosa Circuit of Georgia and Speaker Murphy’s son. Introductions were made by E. Lorene Flanders, Dean of Libraries at the University of West Georgia, and Blynne Olivieri, Head of Special Collections at Ingram Library. When he left office, Tom Murphy had served continuously as speaker of a state house of representatives for longer than any individual in the nation’s history. As Speaker of the Georgia House from 1974 to 2002, Murphy served during the administrations of governors Jimmy Carter, George Busbee, Joe Frank Harris, Zell Miller, and Roy Barnes. Speaker Murphy passed away on December 17, 2007. The University of West Georgia holds the Thomas B. Murphy Collection which includes his papers, memorabilia, furniture and other office contents. Speaker Murphy’s Georgia State Capitol office has been recreated at Ingram Library. 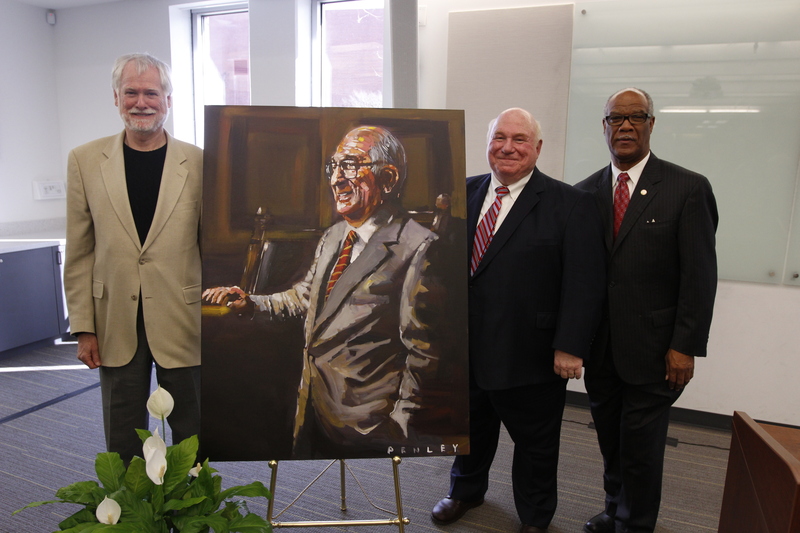 Photo: Mr. Anthony, Judge Murphy, and Rep. Smyre stand with a portrait of Speaker Murphy by artist Steve Penley. Photograph by Charles Robinson, UWG Office of University Communications and Marketing. Webpage photo: Courtesy of Special Collections, Ingram Library, University of West Georgia.